San Diego Comic-Con is a special time of year for the entertainment industry. It's a time for the studios to brag and boast about future projects, leaving a huge stack of teasers and trailers to hunt down and digest. 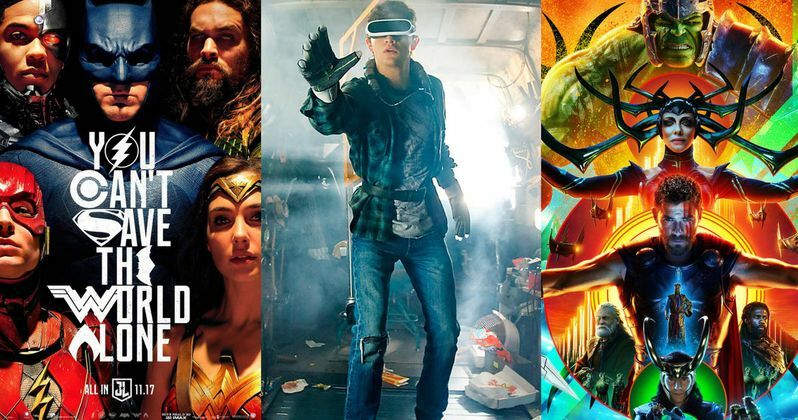 Thankfully, we've got you covered with all of the movie and television trailers that you should know about all in one convenient place. Except for that pesky exclusive Avengers: Infinity War footage. Next up on the hype list has to be Thor: Ragnarok. The footage absolutely killed in Hall H and is all everyone is talking about at the moment. Fall can't come soon enough for that release. Elsewhere, The Lego Ninjago movie, which is sure to be a hit, following the success of the Lego franchise and centers on the battle for Ninjago City. Kingsman 2 also made a huge impression for all in attendance in Hall H on Thursday, promising R-rated action. Pacific Rim: Uprising also unveiled an epic new trailer along with a viral site that is pretty amazing and it was revealed that the sequel will take place 10 years after the events of the first movie. Guillermo Del Toro's new monster was revealed in the Shape of the Water trailer and it looks terrifying. Speaking of terrifying, Netflix released another trailer for Death Note giving us a better look at Willem Dafoe's Shinigami as well as our first look at David Ayer's Bright. To round out the movie portion there's also Brisby Bear, Proud Mary, Jigsaw, and The Snowman as well as Tyler Perry's Boo 2, which surprisingly has two really good jokes in it. While we didn't get to see the coveted Avengers: Infinity War footage that everyone is talking about, DC one-upped Marvel by dropping their latest Justice League trailer on the general public. And it's as notorious for what it didn't show as what it did. While there was plenty of action and humor to go around, it was the final moment teasing the arrival of Superman that has everyone talking. We don't actually get to see Henry Cavill, but we do see the back of his red cape as Butler Alfred welcomes his return. We also got to see the first appearance by main villain Steppenwolf. And there is a lot of hot Aquaman action, not to mention a scene between Wonder Woman and The Flash that is pretty awesome. It is one of the two best movie trailers that was delivered at the con for sure. The second best trailer award goes to Thor: Raganrok. We knew this one was coming, and it served as a nice alternative to not getting the Infinity War footage. The God Of Thunder explains his adventures this time out, telling his tale to non-other than Bruce Banner. We get a smarter Hulk here, as the gladiator arena is further revealed. And there was plenty of action and excitement to go around. While the Thor franchise has not been the most critically recieved of the Marvel movies, this looks to turn things around in weird and unusual ways. The biggest geek-out nerdgasm award surely goes to Steven Spielberg and his trailer for the adaptation of Ready Player One. In a virtual world called Oasis, a teenager finds himself competing in a treasure hunt against ruthless foes after the game's founder dies and and the fortune that he leaves behind is the grand prize. The first footage is chalk full of Easter eggs and cameos (most from other Warner Bros. movies), which include the DeLorean from Back to the Future, Freddy Krueger, Iron Giant, Akira, and a whole lot more. Fans have been examining the footage with a fine tooth comb since its release and Easter eggs are still being discovered days later. The movie looks great, even if some fans of the novel aren't completely on board. This trailer launched earlier than expected. And we got two versions. One R-rated, that shows a man being sliced in half by a magic lasso. It's pretty hard hitting stuff, setting up a story that takes place in America and introduces The Statesmen, along with an intriguing new villain. With their headquarters destroyed and the world held hostage, members of Kingsman find new allies when they discover a spy organization in the United States known as Statesman. In an adventure that tests their strength and wits, the elite secret agents from both sides of the pond band together to battle a ruthless enemy and save the day, something that's becoming a bit of a habit for Eggsy. When legions of monstrous creatures, known as Kaiju, started rising from the sea, a war began that would take millions of lives and consume humanity's resources for years on end. To combat the giant Kaiju, a special type of weapon was devised: massive robots, called Jaegers, which are controlled simultaneously by two pilots whose minds are locked in a neural bridge. But even the Jaegers are proving nearly defenseless in the face of the relentless Kaiju. On the verge of defeat, the forces defending mankind have no choice but to turn to two unlikely heroes-a washed up former pilot and an untested trainee who are teamed to drive a legendary but seemingly obsolete Jaeger from the past. Together, they stand as mankind's last hope against the mounting apocalypse. This trailer is interesting in that it's an actual recruitment video looking for Jaegar pilots. It's the first we're seeing of this sequel, with more to come soon. Lionsgate didn't have an 'official' panel this year. So the fact that they dropped a thrilling first trailer for Saw 8 came as a surprise. And dang, does it look brutal. It's been seven years since the Saw legacy has been on the big screen. But the work of serial killer and karma king John Kramer is rearing its evil head yet again. This trailer makes Jigsaw look like 80 minutes of intense crazy death traps with maybe 12 minutes of story. This could wind up being one of the funnest Saw movies yet. Elisa is a mute, isolated woman who works in a hidden, high-security government laboratory. Her life changes forever when she discovers a secret, classified experiment that involves a mysterious creature. This is Guillermo Del Toro's first movie since 2015's Crimson Peak. And it looks like an interesting twist on The Creature from the Black Lagoon. Del Toro's fans were ecstatic to see the first footage. And while the movie didn't have an official panel at Comic-Con, this was one of the most exciting releases to come out of San Diego. People were terrified to see the first footage from The Snowman. Directed by Tomas Alfredson and based on the novel by Joe Nesbo, this looks to be a faithful adaptation of his Detective Harry Hole books. Which, you gotta admit, that name sounds like something out of a dirty movie. The story revolves around boy who find his missing mother's pink scarf wrapped around the neck of a sinister-looking snowman. Detective Hole is called in to investigate and begins to suspect it's the work of a serial killer. This should be a big hit for star Michael Fassbender. He could certainly use one after a string of recent flops. Weird, wonderful and funny is what we keep hearing about this one. And that's what this trailer delivers in spades. The show "Brigsby Bear Adventures" is a children's television program produced for an audience of one: James Pope. When the series abruptly ends, Pope's life changes forever as he sets out to finish the storyline himself. To do that, he must learn how to cope with the realities of a new world that he knows nothing about. The movie was created by SNL's Kyle Mooney, and features Mark Hamill in a key role. It went over big with the Comic-Con crowd. The battle for Ninjago City calls to action young Master Builder Lloyd, aka the Green Ninja, along with his friends, also secret ninja warriors. Led by Master Wu (Jackie Chan), as wise-cracking as he is wise, they must defeat the evil warlord Garmadon (Justin Theroux), who also happens to be Lloyd's dad. Pitting father against son, the epic showdown tests these fierce but undisciplined modern-day ninjas as they learn to check their egos and pull together to unleash the inner power of Spinjitzu. This footage is full of big laughs and fast action. It looks like LEGO can chalk up another win for its burgeoning film franchise. Taraji P. Henson stars as Mary, a hit woman working for an organized crime family in Boston, whose life is completely turned around when she meets a young boy (Jahi Di'Allo Winston) whose path she crosses when a professional hit goes bad. We only see the young boy for a moment at the end of this trailer, but it seems this assassin takes this young boy in. The trailer is, naturally, set to Tina Turner's version of Credence Clearwater Revival's hit song "Proud Mary," although the tagline puts a new twist on the lyrics, revealing that Mary is, "killing for the man every night and day." Madea and the gang encounter monsters, goblins and boogeymen at a haunted campground. That's all you really need to know. What surprised some is that there are two big jokes that land here. And they are, dare we say, laugh out loud funny. One has Madea interacting with Death. The other reenacts a scene from the blockbuster thriller Get Out. Whatever your opinions on Madea may be, watch and try not to laugh. We dare you. The story outlines Salinger's rebellious youth all the way through when the writer fought on the front lines of World War II where he was assigned to the counter-intelligence division, for which he used his proficiency in French and German to interrogate prisoners of war. During the war Salinger suffered terrible loss and suffered rejection from the New Yorker upon arriving home. The movie focuses on this period up until his PTSD-fueled writers-block that led to his creative breakthrough book, The Catcher in the Rye.